Small sketchbook published by Chance Press, 2010. 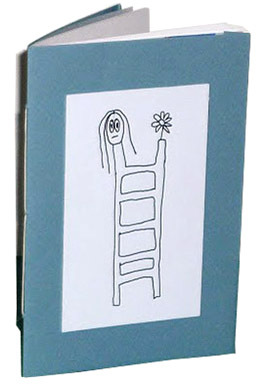 This little hand sewn sketchbook by Carol Es originally appeared in Scribbles in a Sandstorm. It is actually sewn into the spine of the book, Chance Press created a special lone edition of the book, which comes in a variety of colored covers and sold them as "trade" editions. I was given a private edition from the publisher which were limited to only 10. It included a small original sketch of Dan inside with my signature, so they were what you call "special." Dimensions: 5.5 x 3.75 in.